In the first, second, third, fourth, fifth, and sixth parts of the series, you created most of the game, including the networking infrastructure, card animations, and gameplay. In this seventh and final part of the series, you will finally wrap up the game! We will finish up the “Snap!” logic, fix some edge cases, add win/lose detection, and even implement a single player mode with a computer player! Keep reading to finally finish this epic series! So far all the network transmissions you’ve sent were in reliable mode, which guarantees messages will be delivered with their contents 100% intact. The problem with reliable mode is that on a bad network connection that drops a lot of packets, message sending can be very slow. If a message couldn’t be delivered, the networking stack will try again and again and again, until it either gives up completely and disconnects or the message is successfully delivered. Also, even though the packets are guaranteed to arrive, the problem is the order in which they arrive is not guaranteed. You’ve seen the problems this can cause and how to work around them in the previous part of the series. How to deal with these issues? Well, there is another method of sending data over the network and that is in unreliable mode. With unreliable mode the only guarantee is that if the message arrives it will be 100% complete, but it’s sent only once and if something goes wrong along the way, the entire message is dropped. The recipient will never know about it. When you’re writing a multiplayer network game that needs to be real-time, you’d usually send unreliable messages, because you don’t need the retry mechanism. By the time the retried message arrives at its destination it is likely no longer relevant. Therefore it’s better to send everything unreliably and hope that it arrives, and have some mechanism in place to deal with messages that get lost. Tip: In a real-time game that sends position updates using unreliable packets, you’d use a technique called “dead reckoning” to estimate where the game objects will be next, and then adjust when you receive the next network message. Every second or so a larger packet with a full status update is sent, just so that clients are able to bring themselves up-to-date and get the complete picture again. In Snap! you want the PlayerShouldSnap packets to arrive at the server as quickly as possible. Therefore you will now send them unreliably in order to lose as little time as possible. This means that sometimes when a player taps the Snap! button their packets will get lost along the way. C’est la vie. Most of the time the packets will arrive properly anyway. And that’s it. You should test the app to see that tapping the Snap! button on the client still shows the red X on the server, but you won’t notice any differences in how the app behaves unless you’re on a really crappy network. That means after the active player has turned over his card, everyone can yell “Snap!” again. Here you just show the speech bubble and then hide it again after one second. Try it out, for the second player who taps the Snap! button you only show the speech bubble but no red X. Again, for now the speech bubbles will only appear on the server but you’ll remedy that next. Right now when a client yells snap, the server doesn’t notify the other clients that this has occurred – hence they can’t update their displays. You’ll fix this now by making the server send a packet to inform all clients when someone yells “Snap!” — even the client that did so. 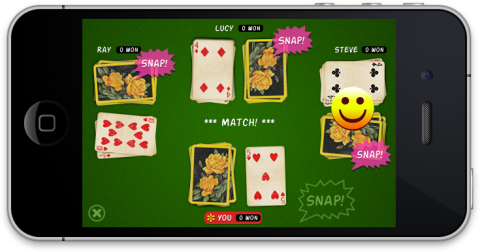 This packet will also tell the clients whether it was a good snap (there were matching cards), a bad snap (no matches), or whether it was too late (another player beat you to it). The way you implement this game, it is the task of the server to make that judgement and tell it to the clients. The snapType property determines whether the call was good, bad or too late. The matchingPeerIDs property contains a list of the players with matching cards; you’ll ignore this property for now. This simply calls the same delegate methods as the server, but now that happens only after receiving a packet from the server, not immediately when the Snap! button is tapped. Try it out. Tapping the Snap! button, either on the client or on a server, should show the speech bubbles (and the big red X) on the client as well. 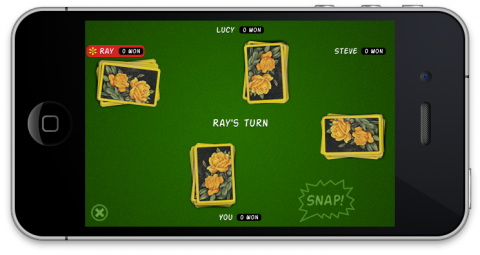 When a player yells “Snap!” when there are no matching cards on the table, he has to pay one card to each of the other players. Because you haven’t built the logic for determining whether there is actually a match on the table, right now the first player to yell “Snap!” is always wrong. That’s OK because it makes it easy to build and test the logic for paying cards. This method first counts how many cards the player needs to pay. Only other players who have at least one open or closed card will receive a card — players with no cards left do no longer participate in the game. Then you check whether the player actually has enough cards on his closed stack; if not, then you first recycle those cards. The recycling procedure will call resumeAfterRecyclingCardsForPlayer: when it is done, so that’s where you continue (even if no recycling needs to happen). both the server and the clients, otherwise the cards get mixed up — and call giveTopmostClosedCardToPlayer: to change the data model. You also call a new delegate method to perform the animation. That’s quite a few changes, but now when a player yells “Snap!” when there is no match, the GameViewController says to Game, “that player has to pay the cards”, and then Game tells GameViewController to move those cards around. The reason that the controller tells Game what to do next has to do with timing. Game doesn’t know when its delegate is done performing the animations, so it depends on its delegate to tell it to perform the next step. You should be able to run the app now. Tap the Snap! button for one of the players and on both the client and the server you should see a card fly from that player to each of the others. Note: Recall that when a client disconnects, the server sends a list of redistributed cards to each of the other clients. After someone yells “Snap!”, cards also have to move from one player to another but this time the PlayerCalledSnap packet does not include such a list of cards. Instead, the clients figure out for themselves what the cards are. Both approaches are equally valid, although in the latter case it is vital that all clients and the server agree on the game state, otherwise one client may show different cards from the others, which sort-of spoils the game. Here you re-enable the buttons, but if the local player has no more cards available, he no longer participates and you hide his Snap! button. Try it out, now turning over cards works again after someone yells “Snap!”. Also do this: flip over all the cards until there are none left on the closed stack — this is quicker if you limit the number of cards on the deck — and then press the Snap! button for that player. His cards should now first be recycled. While testing this, you’ll probably run into some situations that aren’t handled properly yet. 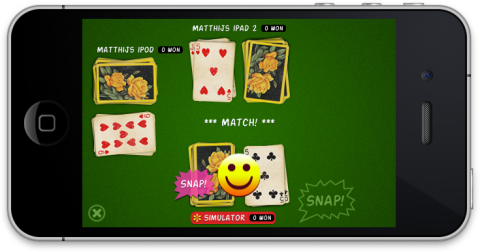 For example, a player yells “Snap!” in a two-player game while he has one closed card left and it is his turn. The closed card gets paid but now there are no cards left for him to turn over. His open stack should be recycled, but that currently doesn’t happen — you only check whether recycling needs to happen at the moment a player is activated. So you need to add some extra logic that should happen after the player paid his cards. You now call the resumeAfterMovingCardsForPlayer: method on Game. This will perform a number of checks — should the active player recycle his cards, and so on — and returns YES if a new player will be made active, which can happen if the active player no longer has any cards left. If the active player didn’t change, you call showIndicatorForActivePlayer again in other to change the text on the center label back to “Player X’s turn”. If the active player has no more cards — he has just paid them all to the other players — then the server needs to activate the next player. Otherwise, if the active player no longer has any closed cards left, they should be recycled first. The “|| _hasTurnedCard” expression in the first if-statement is there to catch an interesting edge case: You (on a client) have no closed cards and it’s not your turn. The other player turns his card and you immediately tap “Snap!”. Now the client ends up paying two cards instead of one. This happens because the ActivatePlayer message starts the recycling and this gets in the way of playerMustPayCards:. If there was any activateNextPlayer method call pending, then it gets cancelled and you wait until resumeAfterMovingCardsForPlayer: to activate the next player. If the active player taps Snap! (when he still needs to turn his card) but he has no closed cards left, his open stack should be recycled and the player remains active until he turns over the next card. If the active player taps Snap! (when he still needs to turn his card) and he has exactly as many closed cards left as there are other players, then he first pays the cards, and after that his open stack should be recycled. After the active player taps Snap! and pays all his cards to the other players, he is out of the game and the next player should be activated. His Snap! button should have disappeared. As the above, but the active player only has one open card left. He’s not out of the game but he no longer gets activated either (because it makes no sense for him to keep turning over that one card). There are a lot of edge cases here that you need to check for. Here is another one: Test this with just two players. The active player has only two cards left: one closed, one open. Tap “Snap!”. The player now pays his closed card, but the open card does not get recycled and the game is stuck because the player cannot turn any cards. That happens because Player’s shouldRecycle only returns YES if there is more than one open card, but not if there is just one. If the active player now only has one open card then you will also activate the next player. Up till now when a player tapped Snap! you have assumed it was a wrong move, so in this section you’ll build in the logic to check whether there are any matching cards on the table. If the Snap! is correct, then you have to move the open stacks from the players with the matching cards to the player who first yelled “Snap!”. For each player, this compares his top-most open card to the top-most open card of all other players. This algorithm will match the following combinations: AABC, AAAB, AAAA, AABB. In other words, it sees two-of-a-kind, three-of-a-kind, four-of-a-kind and two-pairs. Any of these combinations can occur in a 4-player game and they all count as valid matches. Note: AABB counts as one match but the winning player will receive both piles with AA and BB; on the other hand, AAAB gives you AAA but not the pile with B. If the _matchingPlayers set is empty after a call to checkMatch, then there is no match. Note that you call checkMatch on both the server and the client. It's not really necessary on the client, because the client doesn't do anything with that information, but it won't hurt either. This should be fairly straightforward and not so different from before, except maybe the last bit. After one second you call the playerWillReceiveCards: method, but because you want to pass it two parameters -- the player and matchingPlayers objects -- you have to put them into a temporary NSArray. 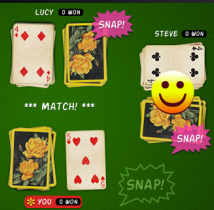 This loops through the players based on their positions -- so it happens in the same order on both the server and all clients -- and if a player is in the matchingPlayers set, it is instructed to give all its open cards to the player who yelled "Snap!" first. You use an existing animation method on CardView to move the cards around on the screen. When all of that is done, you call afterMovingCardsForPlayer:, which is the same method you called after paying cards on a wrong Snap!, so that the Game object can decide what to do next (activate the next player, recycle the cards of the active player, and so on). You can try it out now. Tapping Snap! when there is a match should show a smiley face and give that player all the cards, but -- as usual -- moving the cards only works on the server yet. The server still needs to let the clients know that a successful Snap! was made by sending them a PacketPlayerCalledSnap message. You now create a new NSMutableSet that contains just the peerIDs from the matching players (recall that _matchingPlayers contains the actual Player objects), and you give that new set to the packet. The PacketPlayerCalledSnap class doesn't do anything yet with those peer IDs, so let's add that logic as well. This does the opposite from before. It reconstructs the matchingPlayers set using the peer IDs from the Packet and then calls the delegate to make the animations happen. And that's it. Now the clients will also show the smiley face and the cards being moved around. The problem is that the server turns over the top card before its player has to pay a card to the client, but the client first handles the logic for paying the card and does not turn over the card until it receives the ActivatePlayer packet. So turning cards over at the receipt of the ActivatePlayer message has come back to bite us. I can think of a few solutions here, but because this tutorial is already way too long, you'll suffice with a simple workaround: after the local player turns over his card, you simply disable the Snap! button and enable it again when the next player is made active. This prevents the problem from ever happening, but it's also a bit unfair to the player who is turning over his card because only his Snap! button is disabled, not the buttons for the other players -- if the others are quick enough to react, they have a slight advantage here. This disables the Snap! button if the local player -- the one in the bottom position -- was the one who turned over the card. You're now at a point where you can build in the end-of-round logic that tests whether there is a winner. The winner is the player who now has all of the cards, i.e. all of the other players have zero cards left. Try it out. For testing purposes you may want to reduce the number of cards on the deck (the way you did it before). If you do, make sure you also change the number of cards that checkWinner checks for from 52 to the number on the deck. The nextRound method is similar to beginGame, except that beginGame always starts from a clean slate while nextRound has to clean up the mess from the previous round first. After the dealCards method is called, the new round starts exactly the way you've seen before -- the delegate animates the dealing of the cards and then called Game's beginRound method, which activates the starting player, and so on. Because there will be 52 CardViews on the screen (all belonging to one player), animating them all would take a while and it's not really that interesting to see all 52 views move off the screen. So instead, you only animate the top 5 cards from the stack, which is enough to give the user the impression that the table is being wiped clean, and simply remove all the other card views without an animation. You can try it out now, but the next round starts only at the server. That is because the server hasn't told the clients yet that a new round is starting. You could introduce a new packet type for that, but what actually happens is that the server already sends the clients a DealCards packet (because you call the dealCards method), except that the clients weren't expecting this packet at that time so they ignored it. Notice that the second if-statement is not an "else if". After calling nextRound, the state equals GameStateDealing, and you have to actually deal out the cards. 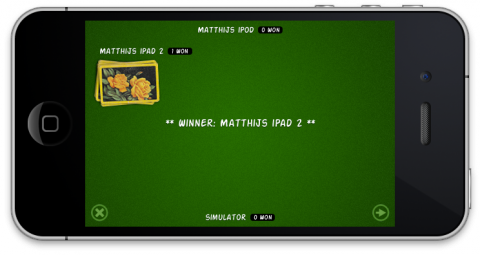 Note: The game still needs quite a bit of work before it's ready to go on the App Store. In its current form it's a bit unfair. The player who hosts the game has an advantage because he sees everything a fraction of a second before the other players. This could be solved by delaying the animations on the server by the average "ping" time. The restriction that you put in that disables the Snap! button after a player turns a card is also very unfair. That was done to avoid a problem with the networking, but it's obviously not how you really should handle this. Regardless of these issues, I hope that this has been a good illustration of everything that's involved in making networked multiplayer games, and card games in particular. I wanted to show you the difficulties of writing multiplayer code, so that you know to deal with such situations in your own games. The reason this game has a single player mode is that I actually wrote it as a single-player game first, just to figure out how the gameplay logic should work. As you've seen, multiplayer networking code can get pretty complicated and as a general development principle, I try to avoid dealing with too much complexity at once. For the purposes of explaining everything, however, it made sense that the tutorial started with the multiplayer aspects first. Just to show you how, you'll now put the single player mode back into the game. Don't send any packets, but use timers to call the Game methods directly. This is the approach taken by Snap!, because it makes a bit more sense for our game. Each client has a slightly different view of the game world -- player positions are rotated, for example, so that the client's own player always sits at the bottom -- and that makes it tricky to make Game act as both client and server. Also add the startSinglePlayerGame method signature to Game.h. Note: You set the isServer property to YES because you want the game to act as the server but with four players instead of one. Now you should no longer get any networking errors (because you no longer do any networking). The reason for this is that in multiplayer mode, the game state changes from GameStateDealing to GameStatePlaying after the server received ClientDealtCards packets from all clients. But because that never happens now, you have to change the state manually here. First you cancel any "Snap!" messages from computer players that still may be pending. These are for the previous set of cards that you're on the table and therefore are now out-of-date. Then if there is a match, or randomly every one out of 50 or so times, you'll schedule a playerCalledSnap: message after a random delay for all computer players. The RANDOM_INT(50) bit is so that even computer players sometimes yell "Snap!" when there aren't any matches. Believe it or not, that completes the single-player mode! It was pretty easy to add because all the game logic already existed, you just had to build some simple rules to drive the computer AI. Phew, that was a loooong tutorial! I hope it was instructive to see how you can make games that look pretty good with just UIKit and UIView-based animation, and how to use Game Kit and GKSession for multiplayer games over Bluetooth and Wi-Fi. Here is a sample project with the finished project from the tutorial series. "Dealing cards" sound based on a sample by tymaue (freesound.org). "Turn over card" sound from a recording by crispy527 (freesound.org). "Good match" sound based on a sample by Timbre (freesound.org). "Wrong match" sound taken from a synthesized waveform by guitarguy1985 (freesound.org). The deck of cards that I scanned the card images from is by Alf Cooke Limited, most likely from the 1950-1970s. For more information on Game Kit and peer-to-peer connectivity, see Part II of the Game Kit Programming Guide. If you have any questions or comments on any part of this series, please join the forum discussion below!